A frequently used development workflow in version control systems is feature branching. The idea is that we develop new features in branches other than the master one. After a feature is tested and ready to be released, it is merged back into the master branch or a release branch for deployment. This approach helps us develop new features without disturbing the main code base. However, developing a feature branch might take much longer than a normal release cycle. This will make merging the branch more difficult since we would have to deal with possible merge, logic, or dependency conflicts. One of the techniques widely used as an alternative to feature branching is feature toggling. Feature toggles (or feature flippers) act like on/off switches. They let us continue development on the master branch while not exposing the partially developed and risky features to the public. We can make sure our features remain fully compatible with the existing functionality in our application. We can temporarily hide a partially built or risky feature (release toggles) or limit finished stable features to a certain group of users (business toggles). These two types of toggles are implemented in the same way but for different purposes. With release toggles, we hide our unfinished features from users except for the development and QA team. These toggles retire when the feature becomes stable. They are usually managed at the code level. By using business toggles, we can make a feature available to a certain group of users, or we can completely disable it due to some conditions – think webshop sale, Xmas theme on your site, etc. They often require an interface like a dashboard to view the status of the existing toggles with the ability to switch them off and on. Feature toggling is used by many large websites including Flickr, Facebook, Disqus, Etsy, Reddit, Gmail and Netflix. Martin Fowler has a good write up on feature toggling, covering the pros and cons and how to use them the right way. In this tutorial, we’re going to lean how to create feature toggles using Toggle, a PHP library developed by Quandidate labs. The basic idea is to activate and deactivate a feature based on some conditions at runtime. As an example, we could activate a feature for the users who registered their accounts in our system a week ago. Toggle is composed of several components. Toggle manager, as the name implies, is responsible for managing feature toggles including storing toggles, retrieving toggles, checking toggles’ statuses, etc. The toggle manager can store the feature toggles in two different ways. One method is an in-memory collection, which is a class wrapping an array of toggles. This class exposes some methods for storing and retrieving the toggles inside the collection. The second storage approach uses Redis to store and retrieve the toggles. The storage class is injected as a dependency into the toggle manager, at the time it is instantiated. In this tutorial, we will use the in-memory collection to store the toggles. In Toggle, every feature toggle is an object with a name and a group of conditions. We evaluate runtime values against these conditions, to decide whether the feature toggle should be enabled or disabled. In the preceding code, the operator applies to values less than 1000. Operators don’t do anything on their own. They are meant to be used with condition objects. The idea may have become a little confusing by now, but it will be all clear when we put it all together in the following sections. As noted earlier, each toggle must meet one or more conditions, to be activated. What is a condition in Toggle? Operators, conditions and toggle objects create instructions for activating a feature toggle at runtime. So basically nothing happens until we check some values against the conditions. user_id refers to our condition’s key in the above example. active accepts two parameters. The first parameter is the name of the toggle for which we want to check the status. The second parameter is the context object. active() checks if such a toggle exists inside the collection. Consequently, it evaluates the context values against the respective conditions and returns a boolean value. Please do notice that we need to add the toggle to the manager using the add() method before the evaluation. // Do something special here. activeFor() takes a Context object as the argument. Now, let’s create a file and name it ToggleConfig.php. We’ll keep all the toggle definitions inside this file. Finally, we will evaluate the toggle’s status and return it as an array. In the preceding code, first we imported all the necessary classes into the script. We instantiated ToggleManager and injected InMemoryCollection as the storage media. Then we added a toggle with one condition. The condition is met when the current hour is less than 20 (8 PM). Finally, we evaluated the toggle status and returned it as an array. We assigned the output of ToggleConfig.php (which is an array of toggle’ statuses) to the $toggles variable. When we’re deploying a partially developed feature into the wild, we have to hide access to it in UI components along with all the entry points leading to the functionality of said feature. As an example, we’re going to use the toggling feature in a Laravel project to protect some UI components and a group of URLs. However, the idea applies to other frameworks as well. Start up a Laravel skeleton project, then proceed. The feature toggles can be defined anywhere as long as they are loaded when our application is bootstrapped. A good approach is to define all these in a middleware class. As a result, a middleware class named ToggleMiddleware.php will be created within our app/Http/Middleware directory. We need to define all the toggles inside the handle() method of this class. For this example, let’s create a feature toggle to give access to a certain group of users. For example, users with the ID number under 100 – the “early adopters”. To use the toggles’ statuses across our application, we will use Laravel’s Config service. To hide UI components related to our feature, we have two options. We can either access the Config service and check the toggle’s status right from the views, or we can do all the logic in our controller and then pass a flag to the view. The latter approach seems to be more appropriate according to best MVC practices. // Our business logic here. In the preceding code, we used blade’s @if statement to check if the flag is true or false. As a result, the last <div> element will be rendered only if showFeature is set to true. If our new feature contains an API or any controller that we should hide from the users, we need to protect them as well. To do this, we create a before middleware, but this time instead of registering it as a global middleware, we assign it to a certain group of routes. Inside the middleware’s handle method, we check the toggle’s status, and if it is disabled, we throw a 404 error. Another approach is that we put a logic barrier at the beginning of the controller classes and throw a 404 error if the toggle is off. However, using this approach, the request is dispatched to our controller even though the toggle is off. As a result, an APIToggleMiddleware.php file is created within the app/Http/Middleware directory. Since global middlewares are run before the route-specific ones, we’re going to use the toggle that we created in our global middleware. The reason why we didn’t define the toggle inside a route-specific middleware in the first place is that we might need those toggles in all controllers. In the preceding code, we used the Config service to retrieve the status for the newFeature toggle. If it is false, we simply throw a 404 error. As a result, all the routes under new-feature/api will be only available to users with ID numbers below 100. By default, a feature toggle is active when at least one of the conditions are met, but this can be adjusted using the toggling strategies that Toggle provides out of the box. This is the default strategy that Toggle uses for checking toggle conditions. In this case, at least one condition must be met for a toggle to be active. The above toggle will be enabled because one of the conditions (user_id) is met. In the Majority strategy, the majority of conditions must be met. For example, if we have three conditions in a toggle, at least two of them must be met. In the preceding code, the toggle will be enabled, because two (user_id and age) of the three conditions are met. In the above example, the toggle will be disabled because the third condition (height) is not met based on the context’s value. Each feature toggle can have three states: active, inactive and conditionally active. When a toggle is manually set to active, it will be always active regardless of the conditions. If a toggle is set as inactive, it will always be inactive. The third state is conditionally active, where the state of the toggle will be dependent on the conditions. This is the default state. So far, we have been instantiating different objects (operators, conditions, and toggles) to create feature toggles. We can also create feature toggles using arrays and YAML files, if we prefer configuration over code. In this approach, we define all the conditions and operators as a multidimensional associative array or as YAML objects. Consequently, we use the InMemoryCollectionSerializer service (which is part of the Toggle library) to create all the necessary operators, conditions and toggles automatically. As we can see, we have an array of toggles. Inside each array, we have two elements: name and condition. name is the toggle’s name and the condition is an array of conditions. In the conditions sub-array, we need to specify the condition’s class (OperatorCondition) but in kebab-case format: operator-condition. The same rule applies for other class names that we use in the configuration array. We also need to define the condition key (in this case user_id) and the operator. Yaml mode is almost identical, but requires the Symfony/yaml package. For more information, refer to the examples. Feature toggles let us develop directly on the master branch without having to deal with merge conflicts. They also help us conceal unfinished and risky features from end users, and we can always roll back in case something goes wrong with the code. However, if we don’t use them cautiously, they can become a nightmare in the long term. We need to make sure that we really need a feature toggle. If we use feature toggles whenever we can, even though they are not needed, at the end of the day we’ll have a pile of barely traceable toggles scattered throughout our code base. This will increase the chances of us exposing buggy features to the public without even noticing it. 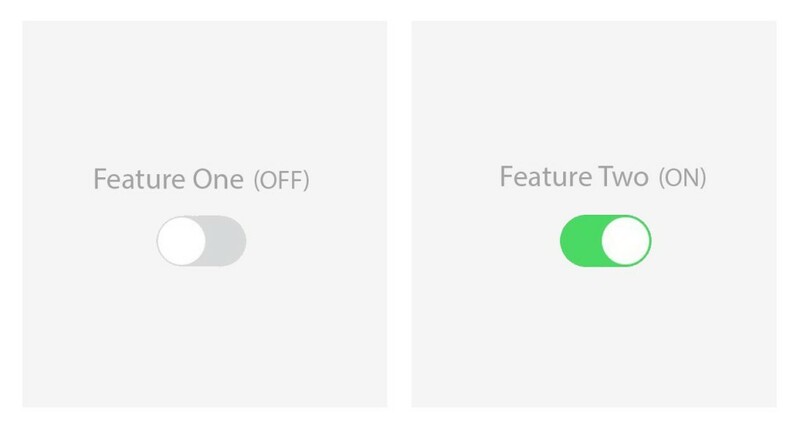 While feature toggling is fantastic for one-off easily deletable switches like Xmas themes, special promotions, temporary profile features etc, they should be considered a second option when developing complicated features. Instead, we should see if we can develop and deploy our upgrades in small commits in each release cycle. Likewise, we should always remove the feature toggles as soon as they are no longer needed. This includes removing the middleware classes and configuration files in which we define them. That said, Qandidate Toggle is a PHP library that makes managing feature toggling much easier than before. We hope you enjoyed this tutorial, in which we started with a basic example and expanded it into a Laravel environment. How do you do feature toggling? Let us know! And if you have any questions or comments, please leave them below! A web developer with a solid background in front-end and back-end development, which is what he's been doing for over ten years. He follows two major principles in his everyday work: beauty and simplicity. He believes everyone should learn something new every day.